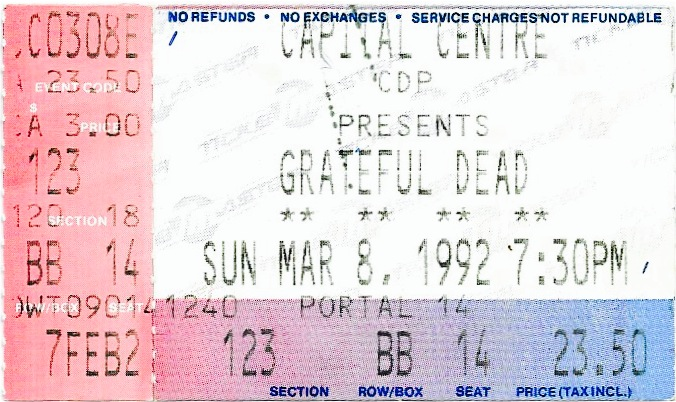 This Spring was special to go to Dead shows because I had just seen my first Grateful Dead show the previous year at the Capital Centre. 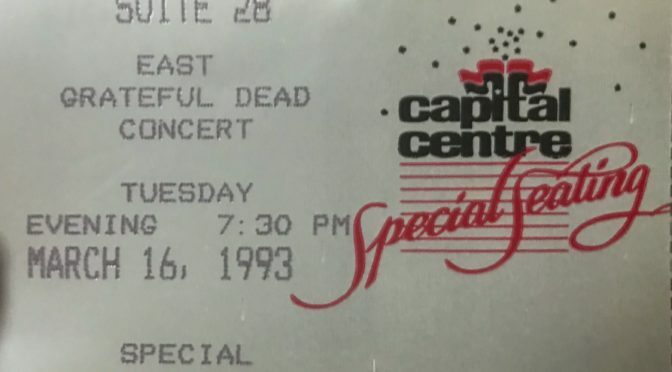 This was the first night of a three-night run at the Cap Centre and I was pump for a couple of reason. One of which was because one of my roomates hooked us up on a skybox. My roommate, Don grew up in Bowie Maryland and one of his hometown friends worked at the Capital Centre. He graciously hooked us up on some NBA tickets and beers in the past. 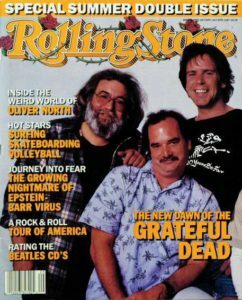 My roommate, Don told me that his buddy’s wife was a deadhead and he was getting a suite for her. He had three extra spots, would I and my buddy Dan, like to go? 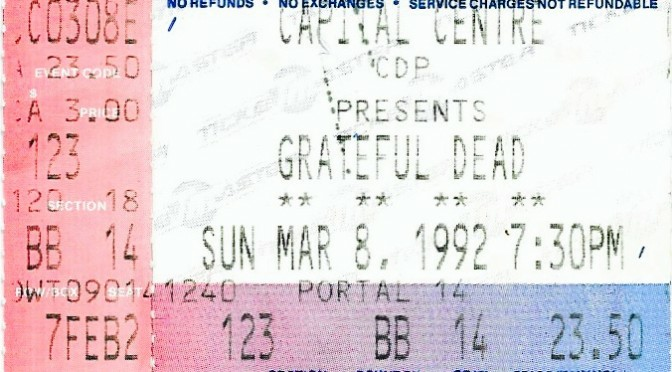 Well it took me like a split second to say hell yeah and call Dan to tell him we had skybox tix to see the Dead! We drove out to Landover and headed up to the suite. We met the people there including my friend’s wife and thanked her for the suite tickets! Needless to say the bonus of a suite is that there was free beer and food. Dan and I started to pound a few and get ready for the show. Now the skyboxes at Landover were nice. Don’t get me wrong. But they were literally up in the sky of the venue. The Capital Centre had a ramp style roof there the center was the lowest point. Typically the opposite. Therefore some of the suites were up at the highest level of the venue. The Grateful Dead typically don’t blast out their sound like many rock concerts. It’s tuned so that it’s loud enough. And typically you could hear the show well. However from the elevated level of the suite it was not loud enough at times, especially if you were not sitting in the skybox seats. So you really had to sit in the seats to hear the show. If you were hanging out in the suite, the show drowned out with the chatter and such. 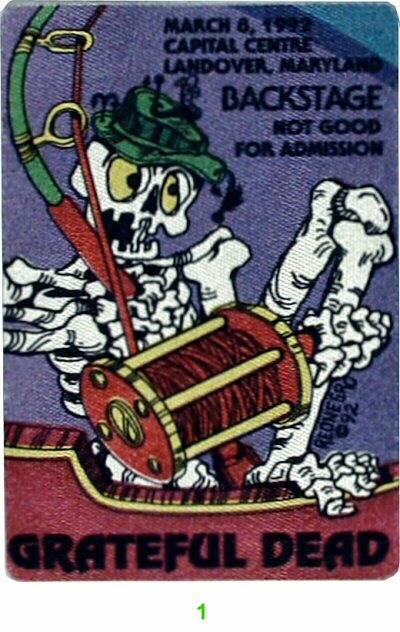 The show started with a hot Jack Straw. When Row Jimmy came on I had to get closer to hear it at first to figure out what the song was. The first set was great. Minglewood, Cassidy were hot. Second set started with a Scarlet–>Fire. Albeit short in length, still sounded good for the time. Second set also has some great song selection with Uncle John’s Band, The Last Time, and a rocking Sugar Magnolia. Sandwiched in between was Morning Dew. This is such a beautiful song that I really did not appreciate as much at the time. Now it is one of my favorite songs as I’ve listen to many of the Dead’s versions as well as covers by The Screaming Trees, Devo and other bands. US Blues closed out the show. Again setlist for this was great. We headed out of the skybox very content both in comfort, food, beverage and entertainment! This is one show that I wish I had gone down to the lower level during the second set to see the energy. Being up high was a bit removed from the crowd and band. But overall a great memory!